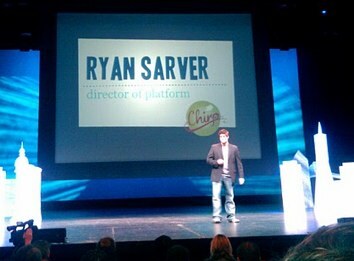 Ryan Sarver, Twitter’s Director of Platform, has just taken the stage at Chirp, where he’s giving third party developers an outline of what they can expect in the future from Twitter’s all-important developer platform. Update: the full talk is now available and embedded below. 75% of all traffic to twitter comes from third party clients, 60% of tweets come from third party clients. Aaron Gotwalt of CoTweet has taken the stage. He and his team went through a series of startups that weren’t working. Eventually discovered it was hard to have multiple people tweet from an account (and there was debate if brands should even be on Twitter. We identified that this was a business product. We realized we were coders, we brought in a CEO. Realized we needed to raise some money. Raised money from great angels. After launching inundated with businesses who wanted this, and they were willing to pay for it. Gotwalt’s advice: Think big. Iterate violently. Don’t get too attached with how it works, or what it feels like. Engage with their clients. Embrace constructive criticism. The role of the platform team at Twitter. 1) Enable Innovation. 2) Reduce Friction. Our job is to try to figure out how to offer new APIs, policies to help you innovate. Developers want more certainty from us. Where are you going so we can work with you? To improve reliability: completely rewrote OAuth. Bug squashing. And maintenance. Expanding capabilities: Roadmap projects that aren’t all launching today. Location. Initially added lat/long. Doesn’t really give context. So adding Places feature to give more context. We’ll have a curated database of all the places around the world. Businesses, parks, etc. We want to take on the burden of curating that data. So all of these applications have the same common lang. Second. User streams. The power of being able to receive tweets as they come in, in real time. Without having to poll the system. This new technology is about streaming all of relevant info to someone’s desktop in real time. No more rate limit, no more waiting, no more polling. Tweets. Social graphs. DMs, favorites, at replies. Now demoing how fast changes are sent to desktop clients. It’s nearly instant, so no more lagging. This is going to be a big deal.
. The thrust is that we want to help fulfill and support you. Part of that is listen/learn/iterate loop. Launching dev.twitter.com (announced at Le Web) later today. It’s a central place where people can congregate so discussions aren’t scattered all over the place. Documentation is no longer hand written, it’s generated from code (so no longer lagging behind). API console based on HURL. Idea is that you can build your own calls at the top, say the data type you want back. We’ve relied on devs a lot to tell us when API is broken. We wnat a better view. We’re using external service called Watchmouse. We’re adding unified search so devs can find tutorios, Google group issues, etc. Q: How are you going to get users to start using geolocation. A: I think it comes down to building valuable apps around it, we need to explain to users why they should use it.